“Remember these? This one is great. Let’s get it,” I heard my husband say as I stood frozen in that antique store, feeling a little sick to my stomach. That sudden rush of angst a few years ago had nothing to do with the fact that an item from my childhood was now in an antique store. No, this was a direct blow to the gut by the ghost of Christmas past. It was the same sudden sense of horrified disappointment I had felt thirty years or so prior, as I stood staring in disbelief at the little ceramic tree perched on top the console television in Grandma’s living room. How could this be? 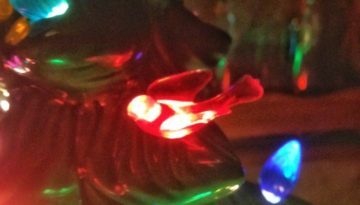 Where was the big fat, to the ceiling, real Christmas tree with its old fashioned, colored bulbs that seemed to burst from the room and embrace you with the warm, happy spirit of the season? Where was the tree that filled the room the same way that Grandma filled our lives — with light and joy? For my brother and me, Grandma made every season of our young lives fun and adventurous. In the spring, we hunted for newborn kittens all over the huge three story barn. Grandma knew her mama cat always had her kittens under the steps on the lower level, but nevertheless, she fully supported our exhaustive search of every nook and cranny. In the summer, we watched in awe as she walked into the chicken house, calmly reached her hand between each sitting hen and her nest, and extracted a basketful of fresh eggs with little fuss and only the occasional, yet triumphantly terrifying, flap of a wing. In the fall, before we were big enough to do it ourselves, we would ride with her in the tractor as she helped with harvest and field work. In cold weather, we made tents in the living room, sat in her small kitchen with her and Grandpa and their beloved dogs, and enjoyed copious amounts of unfailingly delicious treats. At Christmas time, when that big, bright, piny smelling tree went up, well, that was just the culmination of it all; it was the wonderfully tangible symbol of what we knew in our hearts throughout the year. All was good and right in our world. I had been unfazed by the potential truth of the rumors surrounding Santa’s legitimacy, but that ceramic Christmas tree on the tv threw me for a loop. Christmas seemed smaller, and Grandma seemed older! It was unsettling. But, alas, as it was explained to my young self, ceramic trees were becoming the “in” thing (the first time around). Small. Easy to handle. No sap and shedding needles as it need only be stored in a box in the attic, not shoved in and out the front door; less fire hazard without the hot burning bulbs on dry needles if your timing and tree watering habits weren’t just right… it was a long list of practicality. But most importantly, it made Grandma happy. And she was certainly all about making us happy, so the only choice was to stand smiling and resolute with Grandma in that year’s tree selection. Turns out the ceramic tree was the chosen tree for every year we were blessed to have Grandma after that. Her zest for life, and the joy she brought to ours, however, did not change. My niece was born a month before she passed, and yet she was the first of the rest of the family to arrive at the hospital to welcome her second great-grandchild to the world. And before Grandma went the next month, she made sure the homemade frozen cake treat was in the freezer ready for my brother’s birthday, just as it had been every year before. We brought home the tree my husband saw in the antique store. It looked exactly like the one Grandma had, green with multicolored little bulbs and birds. Once again, there was only one choice. He also likes to celebrate holidays and make the seasons fun and festive. Grandma loved him. Last year we acquired a second ceramic tree. That one is all white with all red birds. Grandma loved cardinals, “redbirds” as she called them, so the tree reminded us of her. This year, Cotton joined the family. Don’t let this stately, serene picture fool you. He is capable of bringing both endless joy and destruction to our home. He’s a sweet and loving boy whom we refer to as “Dr. D” (see the previously referenced destruction) when he is on one of his kitten energy-fueled tears. He makes flying leaps and mid-air decisions on the landing point, bats and tackles and chews anything that dangles, and there is no way that a big, beautifully decorated tree in our house this year would not be an equally huge, prominent mistake for all involved. Young Cotton in a quiet moment. We have only the two ceramic trees out this year. One set back on the counter in the kitchen, the other on a mirrored dresser in the upstairs hall to double the impact of the tiny light. Both can be easily moved if necessary. Cotton, of course, has discovered them. But we haven’t needed to take them down. Before we get him down, he limits his activity to sitting, gazing, and then picking a loose bird from its slot — he selected a red one on each tree, and then paw swiping it onto the floor. Recall he’s a kitten, so you’ll understand this same bit of fun is repeated over and over, upstairs and down. Pretty sure it’s Grandma’s way of connecting with this little rascal and bringing her love to our Christmas present. May you know joy and blessings in all times and seasons. Merry Christmas!